I'm an '80s baby who grew up in the '90s. And although I'm aware of some of the things that are considered cool these days, my heart belongs in decades past. Childhood memories make me nostalgic, and the only radio station I listen to is the throwback channel. I grew up on Tomagotchi toys and Rugrats TV. Even though I wasn't as stylish back then as I am now, I have a definite appreciation for all things '90s fashion. 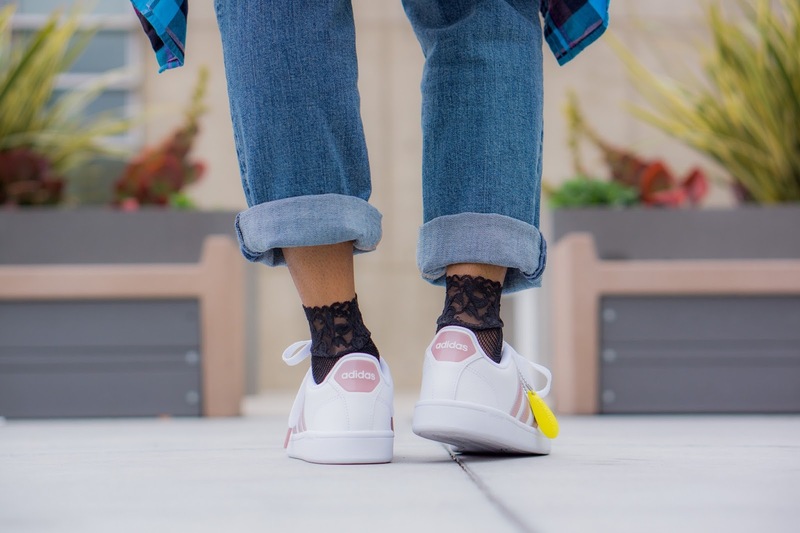 I love how brands like Famous Footwear are showcasing a resurgence of items like athletic shoes that were popular back in my day, and that are now being styled in contemporary ways. One of these shoe brands is Adidas. As a kid, I wore Adidas, and I also happen to be a tennis fan, so I've been into their Stan Smith shoes for a very long time -- long before people were wearing them as casual footwear. I was also very much so a tomboy. Sneakers were the only type of shoe that I would ever consider wearing. They went with everything I owned, which included a bevy of overalls. Sneakers and tomboy vibes bring me back to memories of hanging out with my three best friends in elementary school as we wrote our own version of The Baby-Sitters Club; riding my bike down the street to the corner store without using the handlebars; chilling in parking lots outside the mall before watching movies at the drive-in. Shoes aren't just a part of your look, but they can also be a great way to represent yourself. I'll always say, give me a shoe over a bag any day. 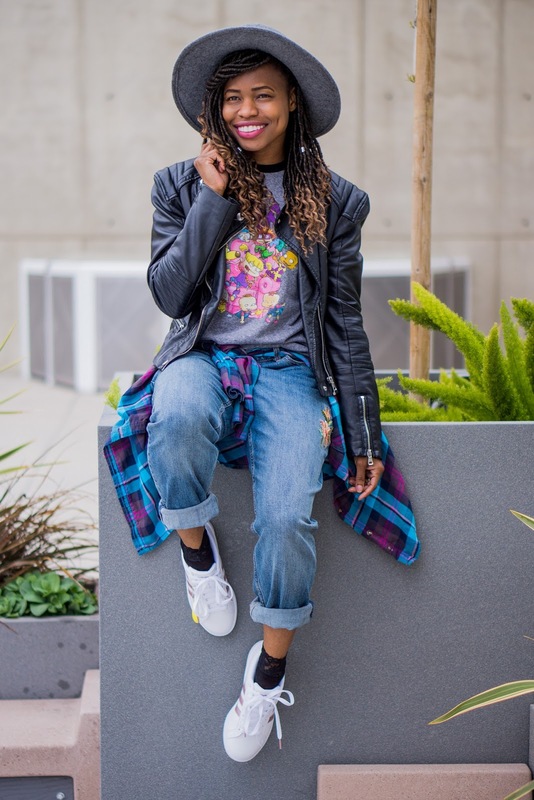 In keeping with this nostalgic vibe, this entire look is brought to you by the '90s with a contemporary update. I'm wearing my Adidas Cloudfoam Advantage Stripe Sneakers from Famous Footwear. 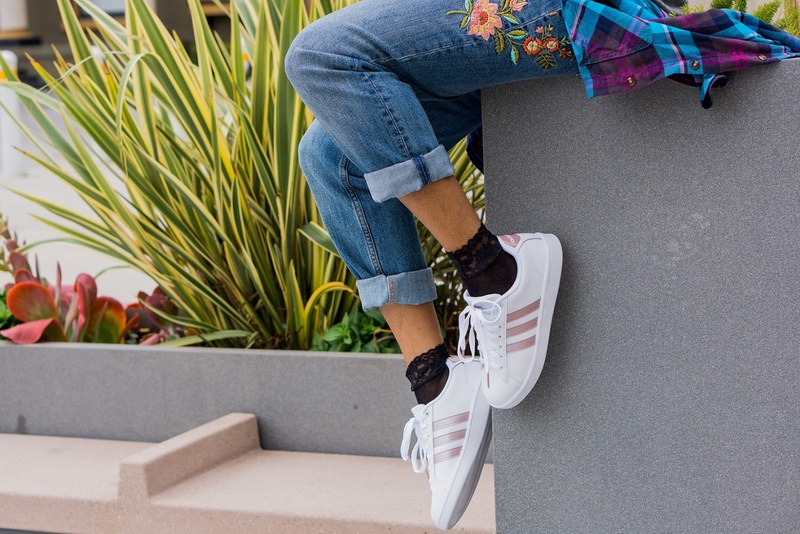 They're the same old school three-stripe look, but they also come in fun colors like rose gold and burgundy. And yes, this look was 1000% inspired by Joey Lawrence's There's Nothing My Love Can't Fix music video from 1993 because there's absolutely nothing more '90s than that! Whoa! 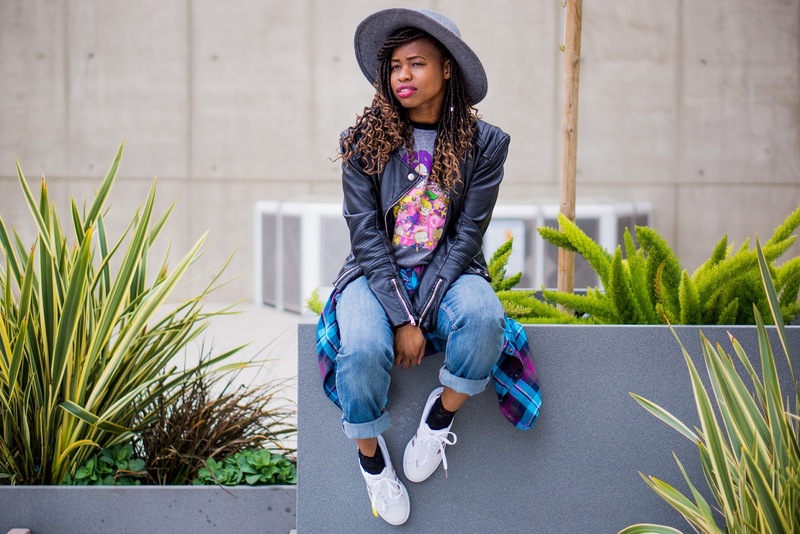 Are you a fan of the resurgence of '90s fashion that we've seen lately? Love this 90s look and the plaid tied around the waist. I don't think I ever left the 90's....heehee...and love the shoes! Adidas is one of my all-time fave brands. When I was a teen-ager, we didn't have a lot of money so I couldn't really afford to buy one then. I'm an 80's baby that grew up in the 90's too! Adidas was totally my go-to and I remember every school year, I would pick a new pair (and the stripes had to be a new color). And I really love the stripes on yours. It's such a pretty color! 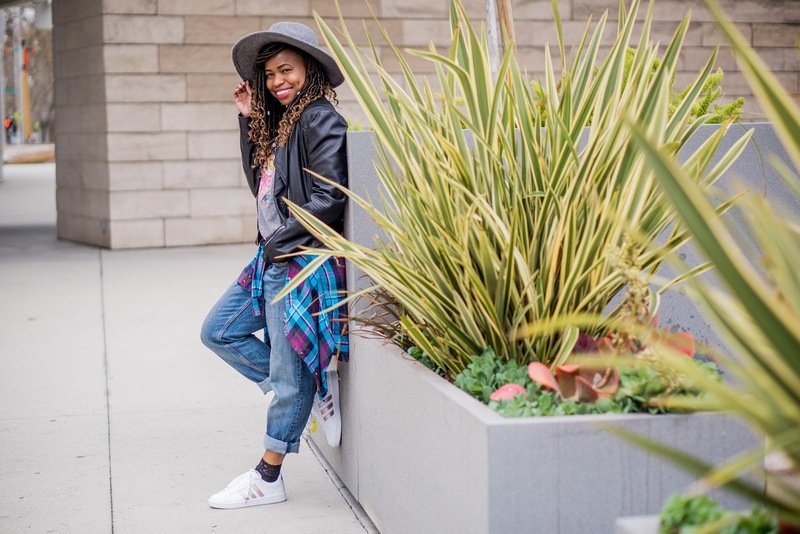 I love Adidas because they have a more petite styling which is better for my size 9 feet! I am definitely loving the 'sports shoes' being in vogue now. I am all about comfort in footwear and clothing :D Love your look. Looks super trendy. Love those Adidas kicks! Your hat looks fab with this outfit too! Love the outfit, love the shoes. I am horrible at branching out when it comes to fashion. This is great! I love how you styled your Adidas kicks! I remember back in the day (man that makes me sound old) when Adidas was super popular!! I had their sneaks and oversized jackets. I'm happy to see the brand back in vogue with their classic sneaks!! I'm also an 80s baby who grew up in the 90s and I'm conflicted about the 90s fashion. But, this is such a classic Adidas design, that I'm excited about it! These are such a cool update on old school Adidas kicks! I totally need to go check out all the colors! So loving the socks and sneaker look! You are rocking it babe! Loving those Addidas! So cute. Loving these Adidas! You're going to live in these bad boys, girl! give me all the adidas you can! love these! I'm an 80s baby too! Definitely remember this style ;-) You pull it off really well! I love this 90's vibe, everything was more simpler. Love your t-shirt. Those are some of my fav sneaks! While I have never worn Adidas and I am not a fan of sneakers... if i had to buy a pair, Adidas it would be! OMG this post gave me all the feels. As a 90's baby, this totally made me smile. I love the style and the fun throwback shoutouts. You're so cute! Loving the throwback look! Back in middle school EVERYONE wore Adidas-- I wish I had a cute rose gold pair like this though! This look is so cool! You look awesome! Big fan of Adidas too, especially the Superstar. I'd love to try the cloudfoam line, I bet that feels so comfy. Anyway, cute look dear, your socks are really pretty! 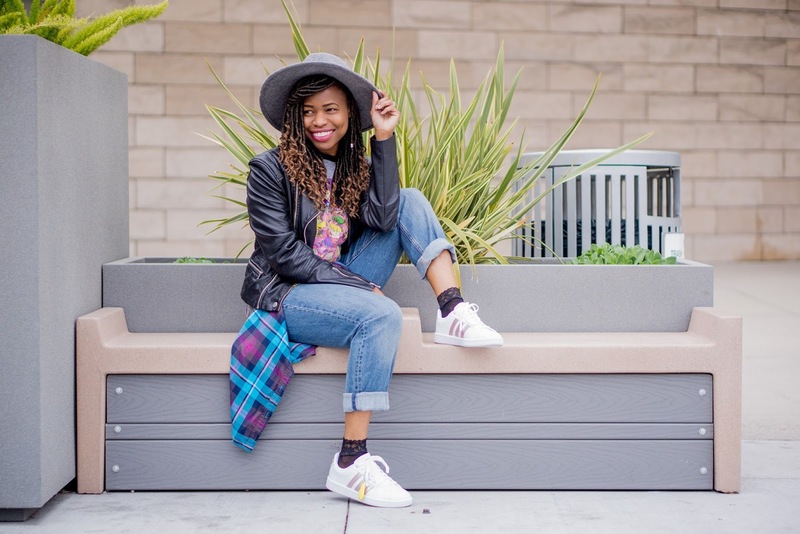 I've been loving the 90's revival of sneakers. Such a nostalgic trip down memory lane. I actually still have my pair of Superstars from my teen years. They're a little on the smaller side otherwise I'd still wear them!